Marvel at the beautiful Fall foliage during this 27 day luxury tour starting in Montréal. Witness Niagara Falls and watch a Broadway show in New York City. In the winter, North America is painted in subdued tones, as if dabbed in watercolours. In summer, it’s as bright and breezy as warm pastel pigments. However, it’s in the fall that you’ll see it at its most beautiful. Autumn is painted in an entirely different palette. With its mauve browns and rusty reds, the fall has a more textured look, as if it’s been created in oils, with the rough brushstrokes of an impressionistic masterpiece. 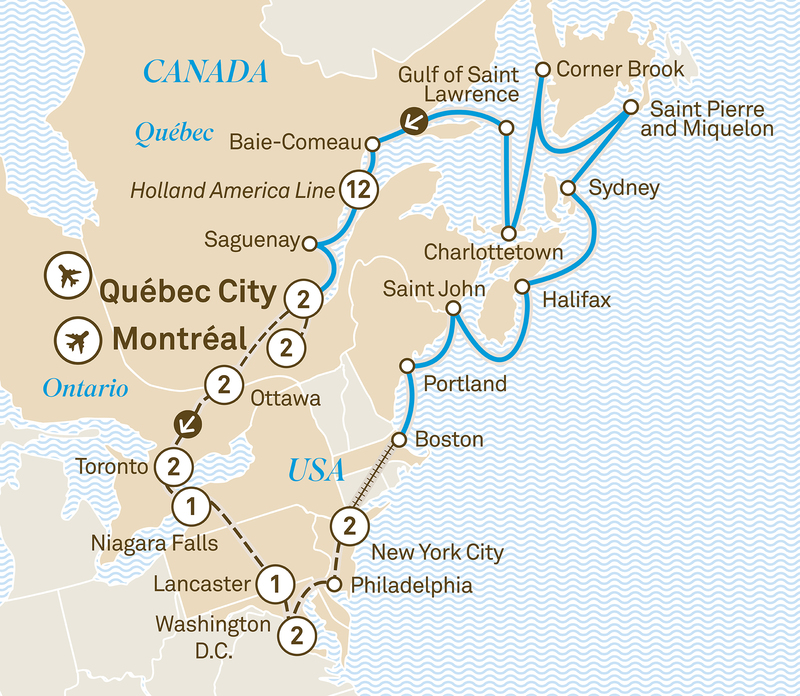 At every point in this itinerary, starting in Québec City, and progressing through Montréal, and Ottawa, and on to Pennsylvania to New York, you’ll get to witness nature’s magic at work, painted on every tree, every street, every mountain and river and city. Parc Oméga is home to bears, wolves, wapitis, red deer, beavers and more. Thrill in the opportunity to get up close and personal with the residents on a drive-through wildlife safari through the unique 1,500 acres. As you’ll discover, some of the animals certainly aren’t shy. Straddling the Rideau Canal, Canada’s capital city Ottawa is nothing if not elegant. And for the next two nights you’ll get to enjoy a more elegant experience than most at the iconic Fairmont Château Laurier, located just moments from Parliament House. Today, unearth the charm of Canada’s capital on a guided tour. The Fairmont Royal York has welcomed royals, presidents and dignitaries alike, and today it will welcome you. Be treated to stunning views of the city and Lake Ontario from Toronto’s CN Tower. Not afraid of heights? Then step out onto the glass floor and outdoor observation area. And later, enjoy a tour of downtown Toronto. Today you’ll cruise to the base of the Niagara Falls to experience one of the most dramatic and powerful natural displays anywhere in the world. Later, you’ll get to relive the wonder from your private fallsview room at the Hilton Hotel and Suites Niagara Falls. Welcome to the USA. Lancaster is home to the religious Amish and Mennonite communities. Savour a traditional home-style Amish feast before settling in to the Lancaster Arts hotel or similar. Visit an Amish farm and house as a local guide explains Amish culture, faith and way of life before venturing to Washington D.C. for a completely contrasting experience. The elegant Fairmont Washington D.C. welcomes you for the next two nights. Enjoy a guided tour of Washington D.C. and gain greater insight into the city’s history and influence. Explore the historic city of Philadelphia before journeying to cosmopolitan New York City. You’ll have plenty of opportunity to embrace the excitement of this world-renowned metropolis during your two night stay in the Renaissance New York Times Square. Today, explore New York during a hop-on-hop-off double decker bus tour. Nothing exemplifies the magic of theatre more than a Broadway production, as you’ll have the chance to discover for yourself at a wonderful show in this entertainment mecca. Relax in your business class seat and enjoy your train journey to Boston. Upon arrival in Boston board Holland America Line’s ms Zuiderdam where you check into your verandah stateroom. For the duration of your cruise, the ‘Signature Beverage Package’ has been included. Modern Portland, first settled in 1633, carries the marks of both subsets of Mainers. The restored brick buildings and warehouses of the Old Port and the fine upright houses of prosperous captains, merchants and shipbuilders make the city’s past a living part of its present. And the waterfront is a going concern with Fishing boats chugging into and out of their berths, buoys clang, harbour seals bark. Saint John, on the southern coast of New Brunswick, is Canada’s oldest incorporated city as well as the only city on the Bay of Fundy. The tiny French islands of Saint Pierre and Miquelon are the last remnants of the former colonial territory of New France. Enjoy the uniquely French architecture, cafes and people. Like many other Newfoundland settlements, Corner Brook started out as a fishing village. Later, one of the largest pulp and paper mills in the world was built here. In the city’s downtown core, West Street and Broadway are the center of action, thanks to numerous pubs, shops and restaurants. Corner Brook also has an impressive amount of green space, you’re always within walking distance of a park or trail. Located in the Manicouagan region, a vast region of dense forest, powerful rivers and sweeping coastline stretching along the north shore of the Gulf of St. Lawrence. With its breathtaking landscapes and rich cultural and religious heritage, it is sure to charm you, while the warm welcome of its people will contribute to a memorable experience. Cruise Saguenay Fjord and marvel at the steep wooded cliffs and immense glacier-carved rock walls. Dock in Québec City where your journey ends. Fortunately, however, the memories won’t.